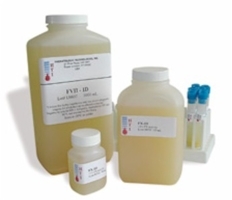 Factor Deficient Plasmas - Haematologic Technologies, Inc.
Haematologic Technologies factor deficient plasmas are for RESEARCH USE ONLY or for further manufacture into in vitro diagnostic reagents. Our deficient plasmas are manufactured from normal, citrated human plasma, and are immunodepleted of the appropriate antigen. One exception is factor VIII deficient, which is chemically depleted of factor VIII activity while retaining normal antigen content (i.e. CRIM+ plasma). Each plasma is then fully assayed to ensure the proper activity of the remaining factors (>50% activity), and is tested for fibrinogen, PT, aPTT, and clarity values. Haematologic Technologies deficient plasmas are shipped frozen on dry ice, and have a five (5)-year expiration when stored continuously at -70oC. Research use only - not for diagnostic use.